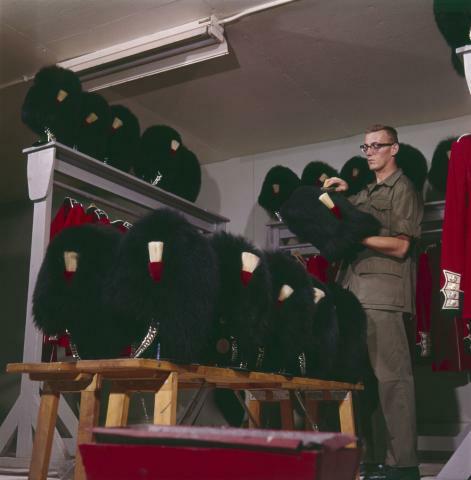 Canadian Guard brushing bearskin hat, 1961. Source: LAC. Item K-5866. Box TCS 01186. A recent case of black bear gall bladder possession in northern Ontario prompted Mike Commito to investigate the transnational connections associated with bear hunting. Frequently black bears are harvested in one area but before or after processing their parts are destined for farther away locations, sometimes as part of an illegal black market trade. Through the course of his research on bear management in Ontario and New York State, Mike briefly takes us through a notable case of international black bear translocation that took place between Timmins, Ontario and the United Kingdom in 1959. The mayor of the gold mining town, Leo Del Villano, offered to organize a spring bear hunt in order to help refurbish the bearskin caps worn by the Queen’s Guards at Buckingham Palace. Consequently, sixty-two of northern Ontario’s black bears became unwitting actors in a broader campaign of maintaining the empire and civic boosterism. It was the last systematically organized spring bear hunt in Ontario and its worldwide publicity alerted many Ontarians to a form of hunting that would be highly contentious for another forty years until it was indefinitely repealed by the Conservative government.